Has anyone EVER managed to get a 100% completed Moogle Stamp Bingo? On my very first card, I came VERY close. I think there were only two squares left. I got the picture with three instances and it cleared six rows at once. The game gives lots of extra multipliers the more rows you clear at a time. If I remember correctly, I got 2000 mog medals from the clear, which was A LOT back then. I don't think the middle square was one of the ones I cleared, though, so I didn't see this animation. I'm sure someone has cleared it like this before, though. I think I remember someone claiming to have done so (or to have been relating someone else's story?) within the first two or three draws ever. Didn't strike me as all that probable, to be honest. I think they said they got 10 000 mog medals, which given serenefire's 2000, doesn't strike me as that far off for such a lottery-winning feat? Of course if you've got the game extracted you might be able to find the exact number/equation in the code somewhere. 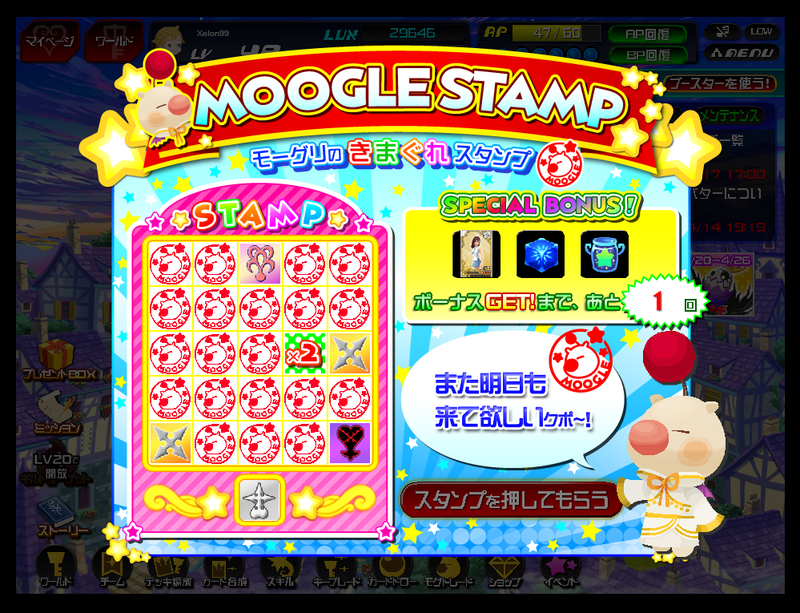 I don't think it is possible to get a full clear with the current rules of the moogle stamp bingo. So, lets set up the sample space. We have a 5x5 grid; the grid is cleared if 3 horizontal, vertical or diagonal lines of 5 are completed; and at most in 1 turn you can stamp 3 spots. We now have 8 lines completed. The next best removal can be in many places and would be breaking a horizontal and vertical line. We now have 6 completed lines. The next best removal is the same as the last, and would be breaking a horizontal and vertical line. We would now have 4 completed lines. For it to be feasible to get a full clear with the current rules, it would have to be possible to get it down to 2 completed lines by removing 3 stamps, but it isn't. Though if there was ever a case where you had a symbol that represented 4 spots, a full clear would be possible.